If It’s Spice You Crave, This Traditional Italian Recipe Is Where It’s At! If it’s spice you crave, amatriciana is where it’s at. Another favorite guanciale-based sauce with Roman origins, amatriciana gets it’s kick from ground black pepper and red pepper flakes. Crushed tomatoes, onion and garlic round out the recipe and give it plenty of flavor. Make sure to stock up on napkins before you serve dinner. You and your guests will be slurping up bucatiniwith abandon. Amatriciana is really that good. Keep in mind: if you can’t find any decentguanciale (cured pork jowl), it can be substituted with pancetta or unsmoked bacon. 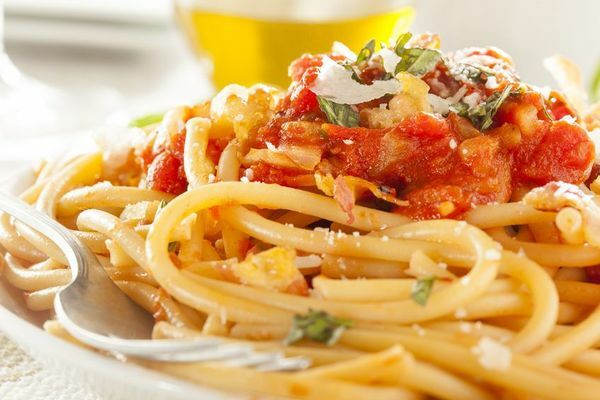 Also, though amatriciana is traditionally paired with bucatini, there’s no reason you can’t use ordinary spaghetti. What counts is the sauce that accompanies it! In a large skillet over medium heat, warm up the olive oil. Add guanciale and sautÈ until crisp and golden, about 4 minutes. Next add the red pepper flakes and black pepper; stir for about 10 seconds, then add onion and garlic. Cook, stirring often, until soft, about 8 minutes. Now it's time to add the crushed tomatoes. Reduce heat to low and cook the mixture until it thickens, stirring now and then. This should take about 15-20 minutes. As the sauce cooks, bring a large pot of water to a boil. Season with salt; add the pasta and cook, stirring occasionally, until 2 minutes before it reaches al dente. Drain the pasta, reserving 1 cup of the cooking water. Add drained pasta to sauce in skillet and toss to coat thoroughly. Add 1/2 cup of the reserved pasta water and cook until sauce coats pasta and pasta is al dente, about another 2 minutes. If necessary, add the rest of the reserved water to make the sauce more moist. Stir in cheese and chopped basil. Transfer pasta to warmed bowls. Enjoy!